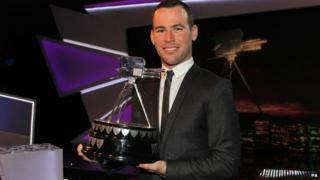 World champion cyclist Mark Cavendish has been crowned BBC Sports Personality of the Year. Golfer Darren Clarke was second with world 5,000m champion athlete Mo Farah third. England's cricket team were named Team of the Year and Andy Flower won Coach of the Year. Golfer Lauren Taylor was the BBC Young Sports Personality - she became the youngest winner of the Ladies' British Open Amateur Championship aged only 16. World number one tennis player Novak Djokovic won the Overseas Sports Personality of the Year. Athletics coaches Janice Eaglesham and Ian Mirfin won the BBC Sports Unsung Hero award. And former rower Sir Steve Redgrave won the Lifetime Achievement award while Bob Champion was handed the Helen Rollason Award.